BH title: "Weak resolve enables jihadists"
Attacks on Tuesday against American missions in Cairo and Benghazi fit into a familiar pattern of Islamist intimidation and Western appeasement that goes back to the Salman Rushdie affair in 1989. The Obama administration's supine response to the murder of American diplomats increases the likelihood of further such assaults. 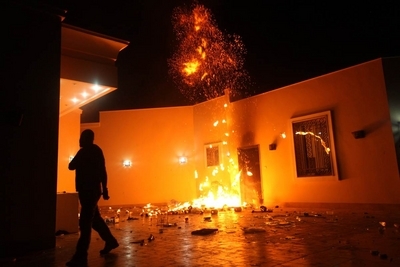 Flames on Sept. 11 inside the U.S. consulate in Benghazi. The Rushdie crisis suddenly erupted when the ruler of Iran, Ayatollah Khomeini, put a death edict on a novelist for having written a magical realist novel, The Satanic Verses, declaring that the book was "against Islam, the Prophet, and the Koran." That incident was then followed by a long list of similar assaults – concerning a U.S. Supreme Court frieze in 1997, American evangelical leader Jerry Falwell in 2002, Newsweek in 2005, the Danish cartoons in 2006, Pope Benedict XVI also in 2006, Florida preacher Terry Jones in 2010, and U.S. soldiers in Afghanistan early in 2012. In each of these cases, the perceived insult to Islam led to acts of violence, sometimes against Westerners but more often among Muslims themselves. Indeed, the 2010 incident caused some 19 deaths in Afghanistan, prompting David Goldman, then of First Things magazine, to observe that "a madman carrying a match and a copy of the Koran can do more damage to the Muslim world than a busload of suicide bombers.… What's the dollar value of the damage from a used paperback edition of the Koran?" Goldman speculated how intelligence services could learn from Jones and, for a few dollars, sow widespread anarchy. So far, the 2012 spasm has led to four American deaths, with more possibly to follow. Jones (with his "International Judge Muhammad Day") and Sam Bacile (who may not exist but is alleged to have created the anti-Islamic video that mainly inspired this 9/11's violence) can not only cause deaths at will but they can also put a wrench in U.S.-Egypt relations and even become a factor in a U.S. presidential election. 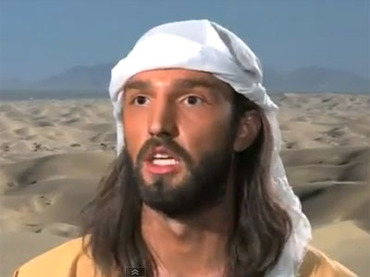 A still from the anti-Islamic movie that prompted demonstrations in Egypt. As for the Obama administration: acting in its usual appeasing and apologetic mode, it blamed the critics of Islam. "The Embassy of the United States in Cairo condemns the continuing efforts by misguided individuals to hurt the religious feelings of Muslims. … We firmly reject the actions by those who abuse the universal right of free speech to hurt the religious beliefs of others." Then Secretary of State Hillary Clinton ("The United States deplores any intentional effort to denigrate the religious beliefs of others") and Barack Obama ("the United States rejects efforts to denigrate the religious beliefs of others") confirmed the initial cringe. 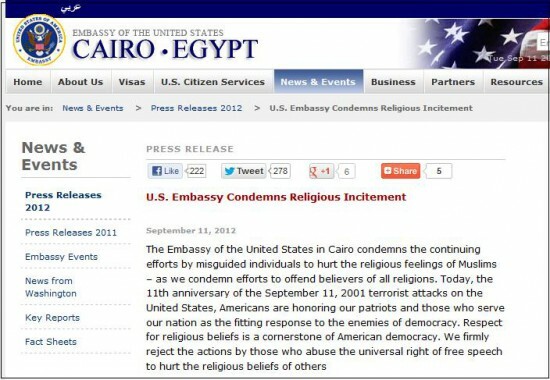 A Tweet from the U.S. Embassy in Cairo. Republican presidential candidate Mitt Romney rightly retorted that "It's disgraceful that the Obama administration's first response was not to condemn attacks on our diplomatic missions, but to sympathize with those who waged the attacks." This argument has very large implications, not so much for the elections (Iran is the key foreign policy issue there) but because such weakness incites Islamists again to attack, both to close down criticism of Islam and to impose one aspect of Shari'a, or Islamic law, on the West. Terry Jones, Sam Bacile, and their future imitators know how to goad Muslims to violence, embarrass Western governments, and move history. In response, Islamists know how to exploit Jones, et al. The only way to stop this cycle is for governments to stand firmly on principle: "Citizens have freedom of speech, which specifically means the right to insult and annoy. The authorities will protect this right. Muslims do not enjoy special privileges but are subject to the same free-speech rules as everyone else. Leave us alone." there are some who ask why we don't just ban such a video. The answer is enshrined in our laws: our Constitution protects the right to practice free speech. Here in the United States, countless publications provoke offense. Like me, the majority of Americans are Christian, and yet we do not ban blasphemy against our most sacred beliefs. Moreover, as President of our country, and Commander-in-Chief of our military, I accept that people are going to call me awful things every day, and I will always defend their right to do so. Americans have fought and died around the globe to protect the right of all people to express their views – even views that we disagree with. Related Topics: Dhimmitude, Freethinking & Muslim apostasy | Daniel Pipes receive the latest by email: subscribe to the free mef mailing list This text may be reposted or forwarded so long as it is presented as an integral whole with complete and accurate information provided about its author, date, place of publication, and original URL.